From dynamic Experiential Marketing events to award-winning promotions, the LONGBOARD Marketing team has the strategic planning, creative development, and passionate activation to make brands stand out. From utilizing star power, buzz-worthy creative, and engaging activities, our exciting marketing campaigns peak your consumers' passion and drive your company's revenue! Check out LONGBOARD Marketing in action! To create a unique marketing campaign that built buzz and educated viewers about the back story of fictional former heavyweight champion Patrick “Lights” Leary, LONGBOARD Marketing brought the show’s star, Holt McCallany, to locations including Super Bowl XVLI events, Freddie Roach's famous Wild Card Gym, and more. From having “the Champ” visit actual red carpet parties, NFL media day, participating in celebrity golf events, and creating interactions with over 100 athletes and celebrities including Drew Brees, Patrick Warburton, Steve Young, Evander Holyfield, Marcus Allen, Larry Fitzgerald, Jordin Sparks, Roy Jones Jr., and more, we created instant credibility and a "wow” factor for the upcoming show and its main character with our “knock out” promotion! ESPN turned to us to provide a complete overhaul of their campaign by strategically positioning ESPN MNF as the “expert” in pro football. 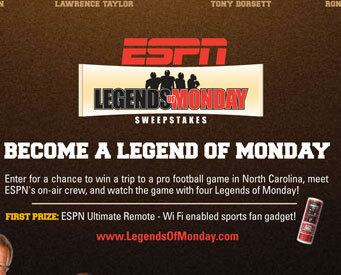 Adding significant star power to the promotion including ESPN talent and HOF players like Marcus Allen, Ronnie Lott, Lawrence Taylor, and Tony Dorsett, we created an eye-catching campaign that had regional winners entering for a chance to meet the ESPN MNF on-air crew and watch a game with our 4 icons! From the microsite, to sell-in materials, to eye-catching POP, to the spot, we can definitely say that this promotion has become an instant legend! The NFL Network needed to promote live games and drive distribution and based on our experience driving demand and creating network buzz, we oversaw the strategic development of the multi-million dollar campaign, the creation of online, print, collateral materials, premiums, grass roots, media/PR opportunities and other tactics. With almost 400 Street Team events, 33 player appearances including current superstars like Tony Romo and HOF legends like Ronnie Lott, Jim Kelly, and Christian Okoye, and the creation of IWantNFLNetwork.com which garnered more traffic than NFL.com and MLB.com combined, the +1MM network demand requests by consumers definitely scored one for the gridiron giant!